The HP SC08Ge Host Bus Adapter (HBA) is a 2 x4 External Port SAS HBA that provides customers with the flexibility and speed they have come to expect from HP. 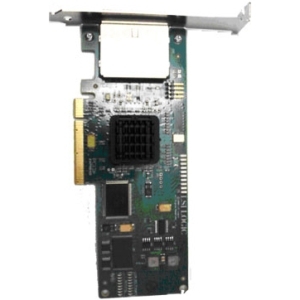 The SC08Ge HBA has been optimized for connection to the new SAS based HP StorageWorks 2000sa and 2000sa G2 Modular Smart Array and provides support for both 3Gb SAS and 1.5Gb SATA devices. Providing up to 2.4GB/s maximum bandwidth with nearly four times the speed of dual channel U320 SCSI adapters. HP’s SC08Ge HBA has been thoroughly tested and integrated into many of the HP ProLiant servers.